While 79% of people in India are Hindu according to the national census in 2015 and there exist thousands of Hindu temples all across India, it is not just in India that hosts some of the most beautiful Hindu temples in the world. There are many Hindu temples outside India. The Tanah Lot Temple sits on the shore of the sea and is one of the 7 sea temples, each temple standing in line to the next and forms a long chain on the coast of Bali. It stands on a big rock and is one of the favored destinations for tourists in Bali. It also holds old Balinese mythologies. Another one In Indonesia and is located at the Central Java of Indonesia. There are eight main shrines, known as “gopuras”, and are 47 meters high. They are further surrounded by 250 other smaller shrines and the whole is one of the biggest in the Southeast Asia. The temple dates back to 850 CE and is also a famous tourist site in Indonesia. The walls of the temple are beautifully carved and tell the stories of Lord Vishnu, Ramayan, Lord Hanuman and other Hindu legends. The literal translation of Angkor wat is “capital temple”. This monument dates back to 12th century and is said to be built by King Suryavarman II of Khmer Kingdom. One amazing fact about it is that it took him 27 years to completely build the temple. Initially called “Varah Vishnu-lok”, Angkor Wat is dedicated to Lord Vishnu. Now, it hosts both Hindu and Buddhist cultures. Located in the suburb of Carrum Downs in the state of Victoria, Shri Shiva Vishnu Temple is dedicated to Lord Shiva and Lord Vishnu. It is also the biggest Hindu temple in the state. This popular Australian, Hindu temple was only built 25 years ago and was designed in Dravidian architecture, a south Indian style. One of the largest temples in U.S.A., this Hindu temple occupies 32,000 square feet and sits on 30 acres of land. Moreover, it is 75 feet high and was said to be built by using 1300 craftsmen, 900 volunteers, 34450 piece stone, 4500 tons of Italian Carrara marble, 4300 tons of Turkish limestone, and 3500 tons of Indian pink sandstone. Just recently opened last year, this temple is one of the largest, covering 162 acres of land, in America. Dedicated to Bhagwan Swaminarayan, this temple is based on two colossal Akshardham of Delhi and Gujarat. North Of Kuala Lumpur, Batu Caves are series of limestone caves and contains one of the largest statues of Lord Murugan (42.7m in height). 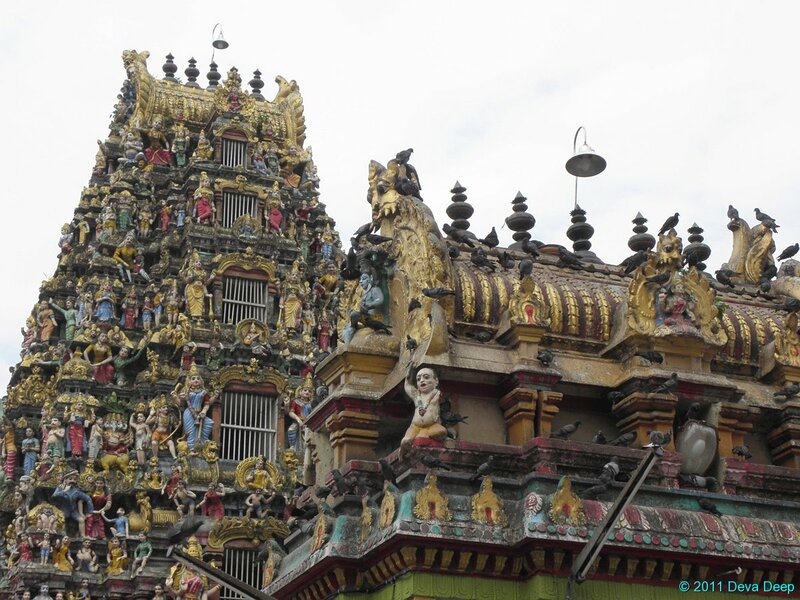 Tamil trader K. Thamboosamy Pillai built this temple in 1890 and is now a favored tourist place in Malaysia. The temple hosts the famous Hindu festival of Thaipusam every year and attracts tourists from Malaysia, India, Australia and Singapore. Established a decade back, this temple is the replicate of Tirupati Thirumala temple of Tirupati, India. It is also the first temple of Lord Venkateswara in Europe and hosts the 12ft. statue of Lord Venkateswara. Pashupatinath is the most important Shiva temple in the world and is also one of the oldest temples in Kathmandu. Initially built by King Jayadeva in 753 A.D., it was embellished during the 12th century and 17th century. The temple is built in Pagoda style and is unique to other Hindu temples all across India. The temple hosts several festivals such as Shivaratri, Teej, and others. While people from other religion can visit around the periphery of the temple, only Hindus can enter it. It is also listed on UNESCO World Heritage. This Hindu glass temple is the only Hindu temple made of glass in the world. Built in a hut-like structure in 1922, the temple draws visitors from across the globe. It is dedicated to Lord Shiva as there is an Athma Lingam sanctuary of Lord Shiva built as a lotus where devotees can pour rose water and pray. About 90% of the temple is made out of mosaic pieces of glass of different colors (around 300,000 pieces of glass have been used). It is designed with Muknirudraksha beads and has a unique embossed texture. Each of the beads contains a chanted prayer and is embedded in walls. 10 of the scriptures in the temple are gold-finished. Part of ISKCON International Community of West Virginia, the name comes from the Indian city of Vrindavan (also known as Brindavanam). It was opened in 1970 and earns a great attracted from people around the world. Labeled as “The Palace of Gold”, the temple was reviewed as “Almost Heaven” by The Washington Post. Revealed on August 7, 1975, Venkateswara Temple of Pittsburgh is one of the oldest Hindu temples in U.S.A. It’s located at the Penn Hills of Pittsburgh. The term Dhakeshwari means “Goddess of Dhaka”, and this temple is considered to be the most important Hindu temple in Bangladesh after Ramna Kali Mandir was demolished by Pakistan Army in the Liberation War in 1971. It is state-owned and thus is called a “national temple”. Located in Little India of Yangon downtown of Burma, it was built by the immigrants in 1871 while Burma was still part of British India. The temple is colorful and contains images and carvings of different Hindu gods. Now, it is looked after by Indian Hindus of the locality. Sri Siva Subramaniya temple was constructed in the 1826 and had to be rebuilt completely in 1986. This temple is the largest temple in the Southern hemisphere. This temple sits on the island of Goyave de Chine in Mauritius. It was only constructed a decade ago and holds the statue of Shiva, which is 108 feet high and bronze in color. It’s the location that makes this temple the monument of beauty and thus is a tourist attraction. Constructed by Merchant Community of Gujarati people setting in Muscat in 1987, Shri Krishna Temple is huge and can hold 500-700 worshippers at a time. The temple was extensively embellished in 2013 and all facilitated for the visitors. It is an important Hindu monument in Singapore (also in the national monument of Singapore) and is also called Chettiars’ Temple. Built by Tamil Chettiar community, the temple is dedicated to six-faced Lord Subramaniam (Muruga) and holds the festival of Thaipusam. This is one of the oldest Hindu temple dating back to 1000 years in Pakistan. However, it is in ruin now because of the negligence of the government. Yet, there is amazing craftsmanship seen on the walls and tiles in the leftovers of the glorious parts. This temple is notable in Sri Lanka and is dedicated to Lord Murugan in the form of holy vel. It is said that Chola queen Sembiyan mahadevi presented the idol of Nallur Devi to the temple in the 10th century and the idol is in the style of Sembian bronzes. It is also known as Nallur Murugan Kovil. Erawan Shrine houses the statue of Phra Phrom and is the Thai representation of Hindu god Brahma. Though it is a Hindu temple, you can notice Thai influence in the designs. There are also performances by residence Thai dance groups in the temple. It is also a very popular tourist destination in Thailand.